Our mission is to bolster academic competition everywhere by making matches easier to run, by making them more enjoyable to watch, and by helping academic teams raise money to support their activities. All of our efforts are directed at elevating the image OF and increasing the attention paid TO academic competition in schools. 1.You deserve the best technology. After all, your students are the best in the school, and what does that say about you? You're the best. 2.You deserve tools that last. That way, you can spend your money on other things. Our systems are warranted against mechanical breakdown, and we guarantee that you won't experience any wireless interference. Slam-In should be the last academic competition system you ever buy. 3.You deserve tools that leverage the investment your school has already made in your classroom. Most teachers have computers, and many have interactive whiteboards, so use them with Slam-In! 4.You deserve tools that are multi-purpose. 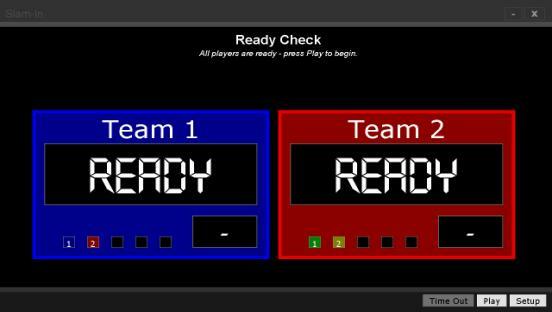 Most buzzer systems are used only by a school's academic team, but Slam-In is designed to be used by all the teachers in a school - for engaging content review, for pop quizzes, for "quiz nights", and anything else you can imagine. 5.You deserve Internet-savvy tools that let you overcome time, distance, and monetary constraints. If you want to play the best team in a different state or if you just want to play a practice match with a team across town, you shouldn't be forced into being face-to-face with your opponent. And you shouldn't have to give up the "feel" of playing face-to-face, either. 6.You deserve outstanding customer support. We provide on-screen hints within Slam-In so that you can learn to use it quickly on your own, but we also offer regularly scheduled online seminars (webinars) for new users as well as one-on-one online tutorials to help you get off to a great start. Direct toll-free phone support is always available, in case you have questions. If you're using Slam-In at an upcoming tournament and have some questions about operating the system, let us know so that we can schedule a practice setup and run-through before the event to assure your confidence and success. These are the things we believe in. Watch us and make sure we stay on track. Better still, join us! We'll go a long way together.